In our 20s skin has a healthy glow and there are little signs of ageing. Skin is supple with great elasticity and collagen support. There is minimal visible sun damage and virtually no wrinkles. However, this is THE most important decade for skin care that will significantly affect how your skin will age for the rest of your life, hence the key word is PREVENTION. On a daily basis our skin is exposed to the sun and free radicals. In order to protect our skin a broad spectrum sunscreen that protects against UVA and UVB rays should be used which act as filters to UV light. 90% of the features of premature skin ageing result from exposure to UVA and UVB rays. They break down collagen, create free radicals and inhibit natural repair. Free radicals cause damage leading to cell dysfunction which in turn affects the body’s ability to make collagen, causes premature wrinkling, precancerous and cancerous skin lesions. The most common causes of free radicals are excess sun, smoking, stress and obesity. Antioxidants such as vitamins C and E can neutralise free radicals and help to prevent and repair damage. This anti-aging treatment option can be obtained in a sensible diet and with topical antioxidant products. Unfortunately due to excessive marketing of cosmetics readily available at high prices, people are inappropriately targeted, overwhelmed by variety, and unaware that these products contain limited ‘active’ ingredients. Cosmeceuticals on the other hand are anti aging treatments that are clinically proven to deliver a tangible and biological result in the skin. These are usually sold in aesthetic clinics and can be combined to suit each skin type and target particular concerns. Alpha Hydroxy Acids: These fruit acids exfoliate and smooth skin and include glycolic, lactic & citric acid. Vitamin A Products: Renewal Cream which can reduce fine lines and improve any early sun damage. Tretinoin 0.5% and 0.1%. Prescription strength retinoids can reduce acne, shrink enlarged pores, even skin tone and improve collagen. Microdermabrasion: Helps to reduce acne scars, fine lines, stimulates blood flow and aids penetration of skin care products. Skin Peels: Lactic, salicylic and glycolic acid peels can improve acne scarring and greasy skin. Mesotherapy with Hyaluronic acid: Optimises antioxidants, vitamins and minerals within the skin. Hydrates and plumps with additional hyaluronic acid. Dermal Fillers: Smile lines from the nose to the corners of the mouth can start to form, as can oral commissures. Small volumes of dermal filler can help plump and lift these areas as well as stimulating collagen. INTRINSIC AGEING of the skin due to our genetics begins in our mid-late 20s. Collagen and elastin production slows down along with cell turnover. Dark circles, visible pores, fine lines, wrinkles, uneven skin tone and dullness may begin to appear. Peptides - These work at a cellular level to increase collagen production and reduce signs of lines. Vitamin A - variety of products available that should initially be used 1-2 a week. Help to stimulate collagen and cell turnover. Skin Ceuticals Retinol 0.3%, Refining night Cream. Glo Therapeutics Retinol 1%, Salicylic Acid 1% and Glycolic Acid 7%. 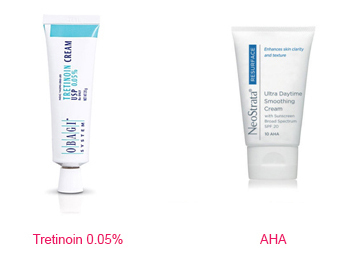 Limit initial use of retinol creams as skin begins to tolerate retinol. Botox: static lines may begin to form such as the frown line. Botox can help to prevent deeper lines forming. Nose to mouth lines and oral commissures can be treated with small volumes of hyaluronic acid. Visible signs of ageing tend to appear in the 30s; fine lines, brown spots, facial veins and old acne scars. Skin care continues similar to that recommended in the 20s with sunscreen, antioxidants, alpha hydroxy acids and vitamin A products. However, some professional aesthetic procedures may enhance their benefits and slow the ageing process further. Antioxidants: Vitamin C supports collagen synthesis. Protects from free radicals. Vitamin A Products: Stimulate collagen and hyaluronic acid synthesis, increase cell turnover and even skin tone. 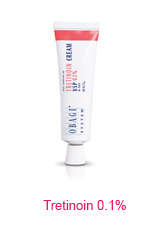 Obagi Tretinoin 0.05% or 0.1%. Peptides: Cellular messengers that help to stimulate collagen, reduce wrinkles and firm the skin. Microdermabrasion: Improves hyperpigmentation, fine lines and aids penetration of skin products. Dermaroller: Reduces acne scarring, pigmentation, enlarged pores, fine lines and wrinkles. Botox: Helps to treat lines that are starting to form. May be useful for deeper static lines that do not respond to botox. During the 40s fine lines can develop into deeper static lines, visible with or without facial expressions, which can significantly age the appearance. There is a greater loss of collagen and elastin which is compounded by the hormonal changes that many women experience during this period. Skin can become drier, thinner and more fragile with dark spots and uneven tone. Volume loss becomes noticeable with the formation of tear troughs, cheek flattening, jowls and grooves from the nose to the mouth. Here are some valuable tips and treatments that can help target these changes. Antioxidants: Vitamin C supports collagen synthesis. High Potency Alpha Hydroxy Acids: Increase cell turnover, exfoliate and repair abnormal skin cell production. Vitamin A Products: Resurface and rejuvenate the skin to provide a clearer, more vibrant complexion. 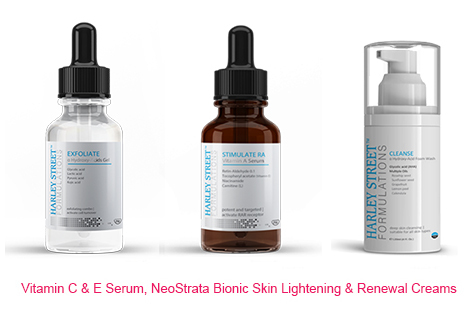 Stimulate collagen and hyaluronic acid. Peptides: Cellular messengers that help to stimulate collagen such as Matrixyl. Argireline reduces the appearance of wrinkles. Microdermabrasion: Targets hyperpigmentation, rough skin, large pores, fine lines and aids penetration of skin products. Dermaroller: Treats sun damage, pigmentation and lines. Mesotherapy with Hyaluronic acid: Optimises antioxidants, vitamins and minerals. Helps to restore a glow to the skin. Botox: Reduces the appearance of lines and wrinkles. Dermal Fillers: Improve the appearance of deeper, static lines. Volumise areas where there has been a noticeable decline in collagen, hyaluronic acid and elastin. PDO Face Lift With Threads: A non surgical method of achieving similar results to a facelift without surgery and scars. The menopause brings dramatic changes in appearance as oestrogen levels drop. Skin can be sensitive and dry whilst wrinkles and age spots are more pronounced. Collagen and elastin breakdown is more prominent. It is important to focus on skin tightening and rejuvenation. It is often at this age that individuals consider more invasive procedures such as surgery. The options below concentrate on less invasive procedures. Many of the products and treatments recommended for the 40s can be continued with some additions. Antioxidants: Vitamin C protects against UV damage, reduces redness and promotes wound healing. High Potency Alpha Hydroxy Acids : Improves cell turnover, pigmentation, texture and tone. Vitamin A Products: Prescription products speed up cell turnover and encourage a younger, radiant complexion. They help to prevent new wrinkles whilst resurfacing and rejuvenating. Hyaluronic Acid: Hydrates and plumps skin. Microdermabrasion: Effective for thickened, rough skin with deep lines. Skin Peels: Medium and deep peels such as TCA 35% and 50% or phenol can help photoaging, severe lines and wrinkles. Dermaroller: Can help to restore skin tightness and improves wrinkles. May be used on the neck and chest which are often show tell-tale signs of age. aser Resurfacing: Targets redness, sun damage and lines. Promotes skin regeneration. Radiofrequency: Radiowaves which can tighten the skin and reduce the depth of wrinkles. Monopolar radiofrequency is typically used to treat sagging and skin laxity. Botox: Reduces the appearance of lines and wrinkles. Can soften lip lines, chin dimpling and help to lift heavy eyebrows. Dermal Fillers: Correct deep lines and restore loss of volume in the cheeks, chin and temples.